My kids at home are HUGE box of chocolates fans. If the box is heart shaped, they love the idea even more. Although to be honest, they take a lot of first bites only of these chocolates. So maybe the cute packaging entices them! Either way, boxes of Valentine chocolates is a motivating idea to use with a literacy learning center for February. 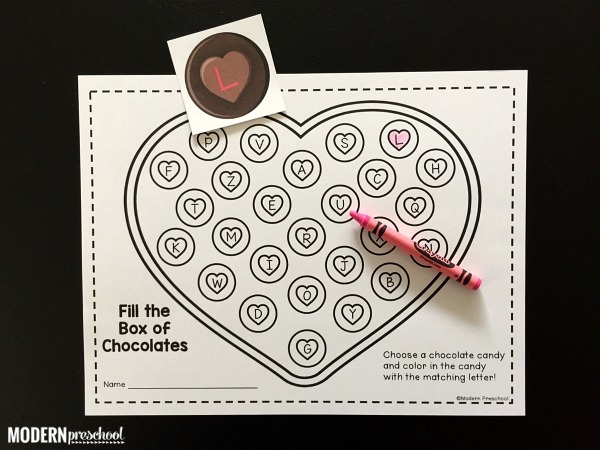 Our free printable Box of Valentine Chocolates Alphabet Match allow preschoolers and kindergarteners to practice uppercase and lowercase letter matching with a side of fine motor skills while focusing on coloring in just one heart at a time. My pre-k kiddos rock these kind of activities at this point in the year! 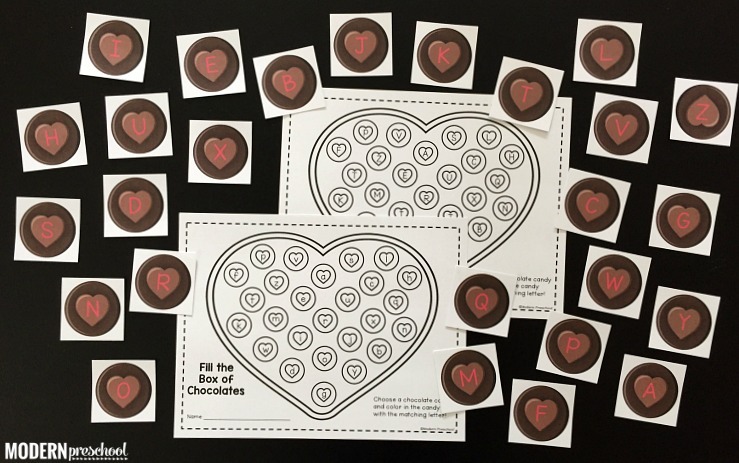 This printable literacy center activity includes 26 uppercase chocolate hearts cards, 1 lowercase recording sheet, and 1 uppercase recording sheet. 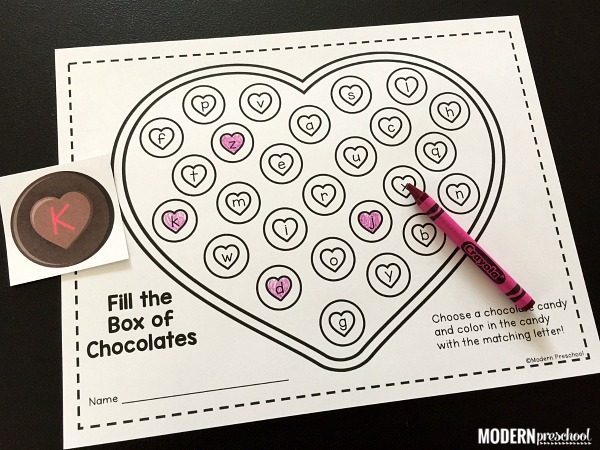 Print and prep the uppercase chocolate hearts cards. I prefer to laminate the pieces for my classroom. It never fails that at least one fidgety little learner bends my printable pieces, so laminating saves me from prepping activities over and over again! Print the recording sheet that will work for your classroom. Or print both to be able to work on different learning levels during small group time. In my own classroom, I set up and play these kind printable activities like our Valentine Chocolate Alphabet Match in a few different ways. I find that this helps all of the different leveled learners succeed without frustration, which is always my ultimate goal. Initially, I introduce the activity in circle time. We play together. My pre-k kids take turns picking a card and identifying the letter. Then I find and color the letter on the recording sheet. I use silly non-examples, which they call me out on as though I was completely serious. I really love this age. But working together and successfully finding letters will help my small groups know the expectations when they get to that literacy center. With my higher learners, I get them set up and let them go! I love this time of year because I have learners who are so ready for kindergarten. I don’t hold them back at all. I make sure they are writing their first and last name on their papers, and that they understand what to do. It’s really amazing to see their work! For my lower learners, we work together. Each learner in the small group takes a turn picking a letter card. We help each other identify the letter if needed. Then we use our fingers to work through the hearts on the recording sheet until someone find the match. For these learners, we use the uppercase letter recording sheet, to work on identification and exact matching. We also may not complete the entire alphabet in one sitting. It may be a 2 day center for this group. For everyone else, it always depends on the day with how we work the small groups. Sometimes I’ll get them going and then check in very frequently to make sure everyone is still on task and finding success. Sometimes the groups need a teacher sitting with them still while we chat about letters, coloring skills, letter sounds, and anything else brought up. I find that while some kids like to work in a quiet environment, some kids cannot succeed without a little bit of “background noise” and conversation. 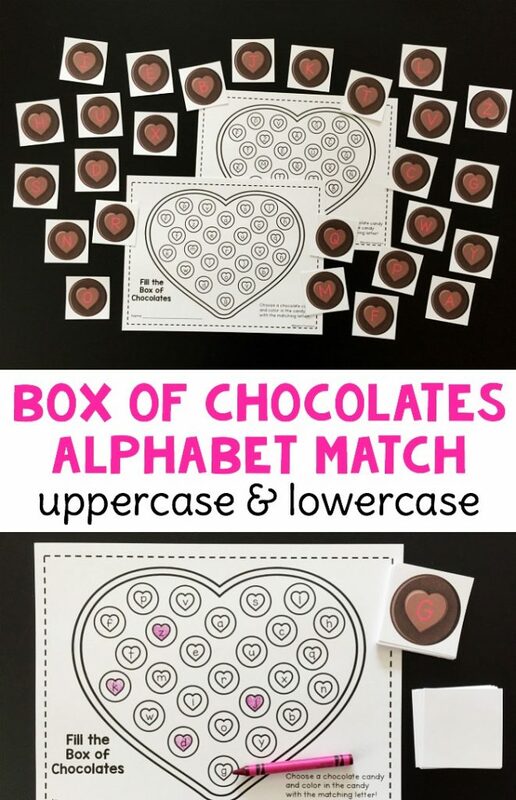 How will you use this free printable Valentine Chocolate Alphabet Match activity? Grab the file from the button below. Love the activity , but can’t download. Entered email and didn’t move from there.